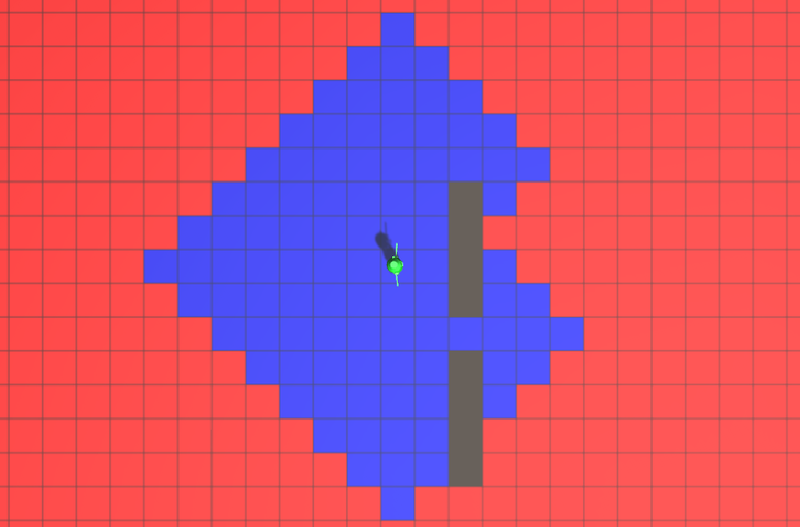 I have a character that is placed on a grid. It has a variable maximum walking distance. Grid fields can be walkable or not walkable. As the character may has to walk around certain not walkable fields to reach his destination his maximum walking distance isn't allways represented by a circle. The function is called with the players position and maximum walking distance (steps) and get's the four neighbour fields and unless the steps are zero calls itselve for every neighbour field with the maximum walking distance decremented. As you can see in the screenshots, this works absolutely fine. The problem is, as the calculation not only goes away from the player but, in some recursion paths, goes back and fourht between tiles until stepcount zero is reached without even having traveled one field, that this way of calculating the path is really resource heavy. For a walking distance of 7 there are 27646 possible walkways that all are getting calculated. If a player is able to walk 11 fields the calculation takes a few seconds, if he can walk 12 fields Unity crashes while calculating. Is there a way to calculate this more efficient? Iterate in a breadth-first rather than depth-first manner, so we visit cells in order of shortest distance from the start point. This ensures we don't inadvertently mark a cell visited after finding a long route to it, blocking us from exploring a shorter route through that cell later in the search. Don't allocate new collections (new List...) in every iteration of the search - this puts more load on the garbage collector than we need. Here's an example of how we can do this. Here we pass in & populate a dictionary mapping positions to distances. The caller can then iterate over the keys of that dictionary to find all the reachable sites, and check the values associated with those keys if they need to know the distance to them. You can use this information to reconstruct the shortest path to any reachable site. // Simple record for book-keeping about our search in progress. // Stores the nodes at the frontier of our search. // The Queue type ensures we visit nodes in a breadth-first order. // Populates a dictionary of reachable tiles. 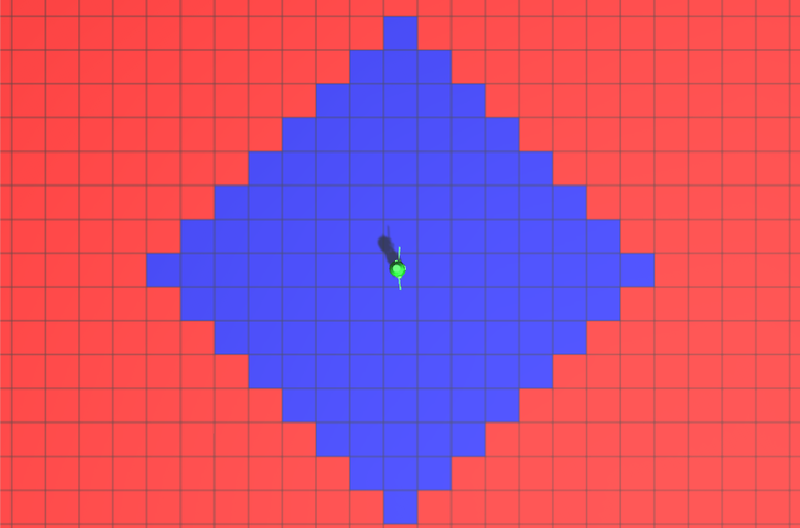 // Clear the results of any previous pathfinding. // Seed the pathfinding with our start point. // Pop the oldest one out of the collection. // and add it to the collection if we can reach it. // Exclude nodes that are out of bounds or not walkable. // Exclude nodes we've already visited by some other route. // Aha! We found a new walkable node in range. Add it to our reachable set. // to later explore its neighbouring nodes. I am not sure what is the code you wrote, but when you are getting all nearby fields, it will return you field that you have already checked for. By recursion, you naturally iterate much more squares than necessary. The solution is: have a hashmap of already visited squares, and if the square is visited, do not look for his neighbors. Well, for this, path searching algorithm can be used (which is something you tried to write ,,come up with"). I would suggest you to look up algorithms like BFS, you can find many examples along with sources online. BFS marks visited squares so it is optimized. Also, the complexity would be N, N being the max amount of squares you can visit. Alternatively, please note that BFS is not so performant if you have no or small amount of obstacles, for that would be better A* (if you will later walk towards some point). Not the answer you're looking for? Browse other questions tagged unity c# path-finding recursion or ask your own question. Unity - How to calculate max distance (range) of a Projectile taking drag into account?